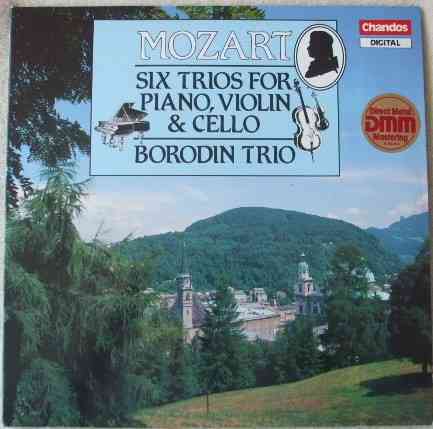 33rpm double LP Record of DBRD 2008 Mozart SIX TRIOS FOR PIANO VIOLIN AND CELLO featuring the Borodin Trio (Rostislav Dubinsky, violin; Luba Edlina, piano; Yuli Turovsky, cello). It was issued on the Chandos Digital label in 1987. The records themselves are graded at least excellent, with no more than the odd light surface mark visible when viewed under normal house lighting. Play-tested on a USB turntable. Superb sound quality with no jumps, repetitive ticks or crackle and just a very occasional pop over all four sides. More or less faultless playback. The gatefold sleeve is graded excellent, with no more than the very lightest storage and handling wear. The spine is intact and strong with no loss to the lettering. The inner sleeves have no wear to speak of.